New Mexico Gov. Michelle Lujan Grisham, a Democrat, last week signed a gun control bill previously vetoed by her Republican predecessor. The measure, SB 328, strips Second Amendment rights in situations involving protective orders, making the surrender of guns possessed by a subjected individual a mandatory requirement. Narrowly approved by the state legislature, Republican Gov. Susana Martinez scuttled a similar proposal in 2017 saying it was unneeded because judges in the state already have the power to issue gun seizure orders along with restraining orders in domestic violence cases. “This new law will save lives,” said Lujan Grisham about the move. The bill is not the only gun policy measure signed by Lujan Grisham since taking office in January. Last month she approved a controversial proposal making it a misdemeanor crime to sell or transfer a gun in a private transaction without a background check performed by a third party. Other bills, including a “red flag” law allowing courts to temporarily seize the firearms of gun owners thought to be at risk and a third bill establishing a mandatory gun lock requirement, tanked. 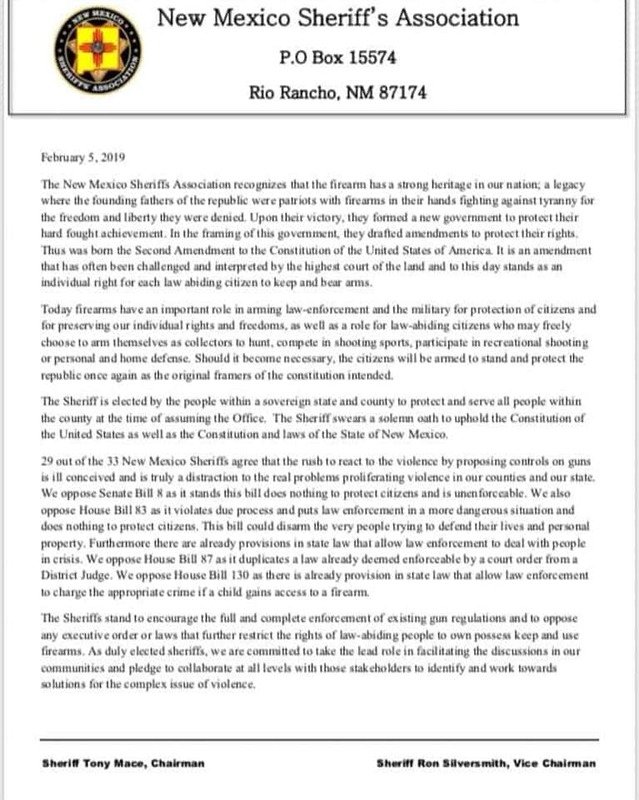 The glut of anti-gun legislation brought push back from state lawmakers triggered 29 of New Mexico’s 33 sheriffs to join in opposition by issuing a declaration through the state sheriffs’ association, holding the proposals were duplicative, could trample on constitutionally guaranteed rights, and just plain unneeded. As for Lujan Grisham, a former Congresswoman who was a reliable vote in Washington when it came to gun control, had the strong endorsement of groups such as Giffords and Moms Demand Action in her run for the Governor’s Mansion. Statewide last year, Everytown provided $400,000 to Dems running for office in New Mexico.